Designed by Ronald Kint-Bruynseels in 1984, Die in Prison has been around for quite a while. 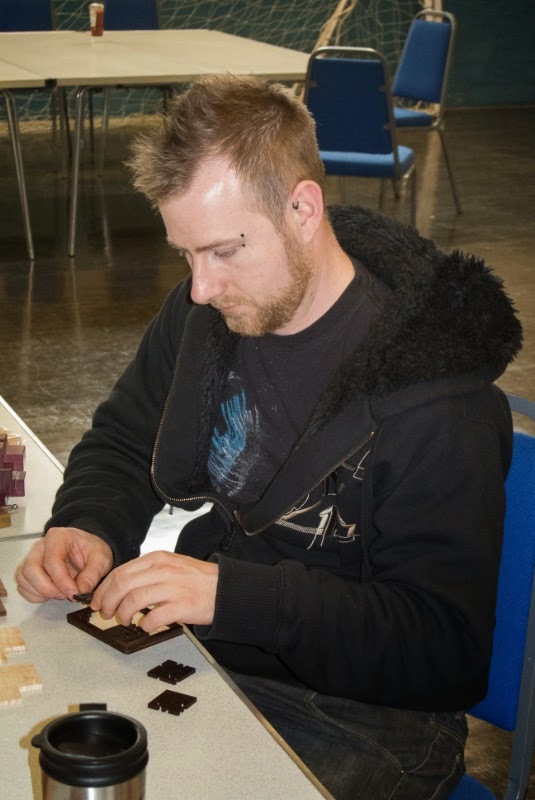 Eric Fuller crafted his first version back in 2003 when he put twelve copies up for sale and warned that it was unlikely that he’d make any more of them. Five years later he had a change of heart, and a new idea, and produced his second version of Die in Prison, this time with a bit of a twist – the Die in the Prison was in fact a puzzle box. I managed to snag a copy in a recent auction – the only way to find them these days as Eric’s original run of 24 copies sold out years ago. Given that he needed to fit a puzzle box in the centre, it’s a reasonably decent size for a burr. 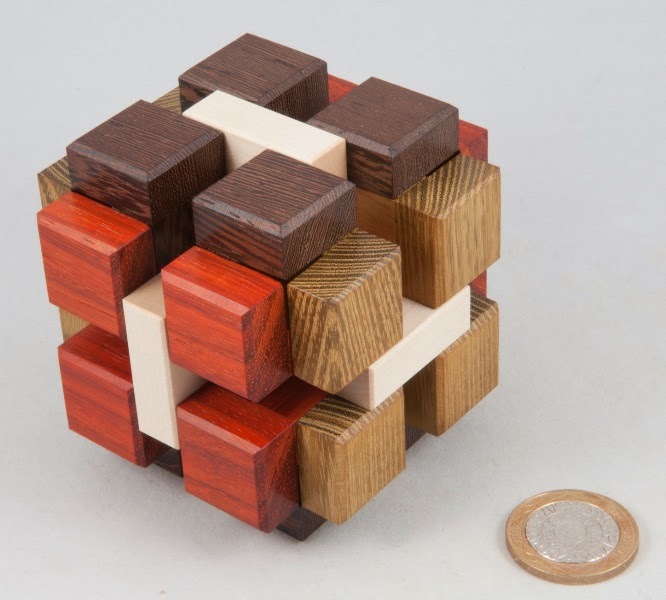 Starting the puzzle, you have an interlocking frame surrounding the box in the centre and at first it doesn’t seem like any of the pieces move at all. 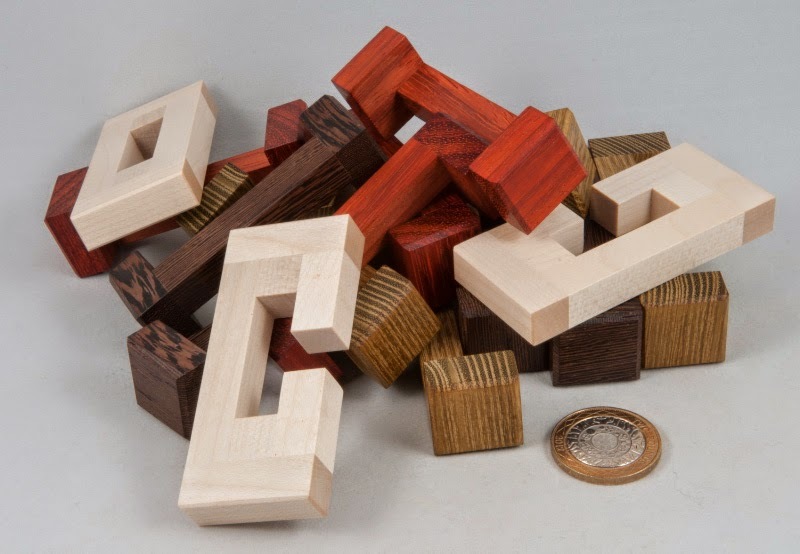 Examining the pieces from the outside will give you a clue as to how the pieces are likely to interact, and once you find the right place to start you’ll start moving things around a bit, creating more and more opportunities to move other bits – until you have a pile of pieces and a cube-shaped box in your hands. Fast forward a few weeks and I find myself sitting here needing to write up a blog post, and I’m fiddling around with the box and I have an idea, which I explore a bit and finally find my way into this little box. As usual I had totally over-complicated things inside my head and it’s a wonderfully simple, elegant little mechanism. Rather chuffed to have been able to add this little beauty to the Fuller shelf in my cabinet. Satomi had some new things for sale at last week’s MPP and I found myself picking up a couple of new Karakuri boxes that I’d had my eye on. 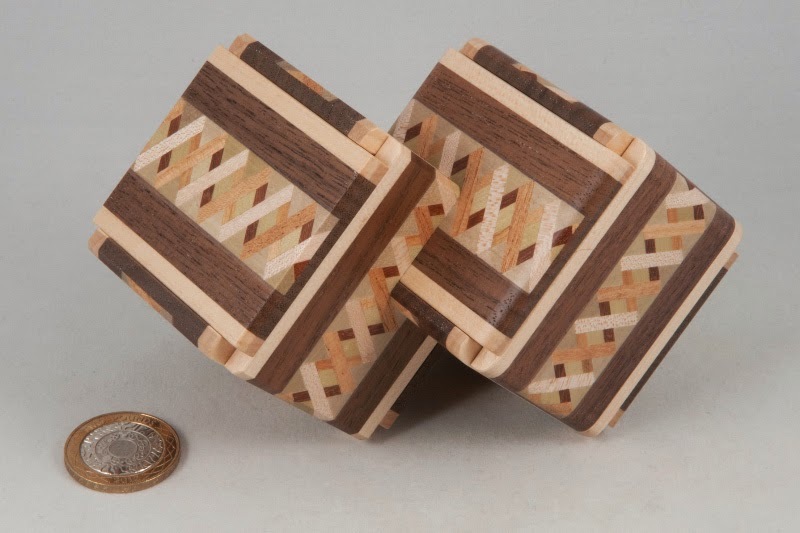 Hideaki Kawashima has recently made a second run of Duet with some rather handsome custom yosegi sides. 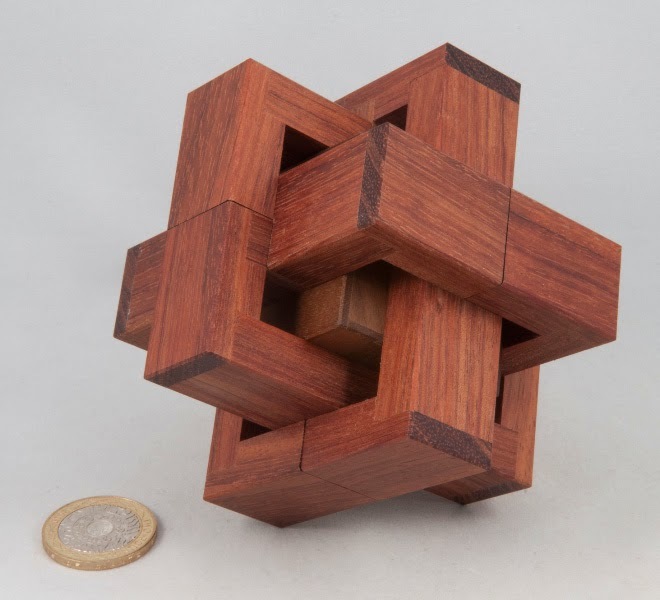 At first glance you have a pair of interlocked cubes, with the yosegi pattern hinting at the interlocked nature of the cubes and the eventual solution. 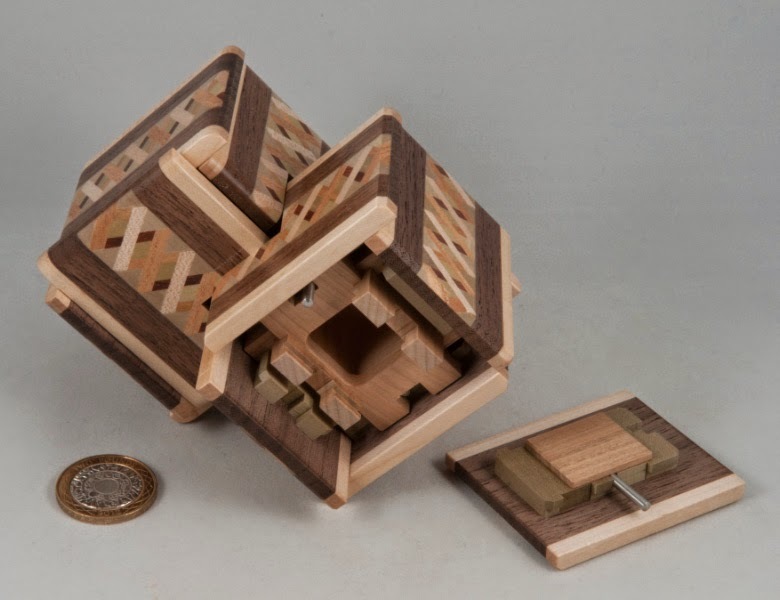 You’re told there are two compartments and a quick glance at the puzzle suggests how the panels are likely to move, and you might suspect that there’s something interesting in the bit in the middle where the two cubes are joined … there is, and it’s very clever indeed. Finding the first panel to move is a reasonably straight-forward process of elimination – finding the second one brings the first little hint of the surprising nature of this puzzle – follow the process and you’ll fall into a wonderful rhythm that lets each panel play it’s part until at move 24 you’ve opened the second of the two compartments. 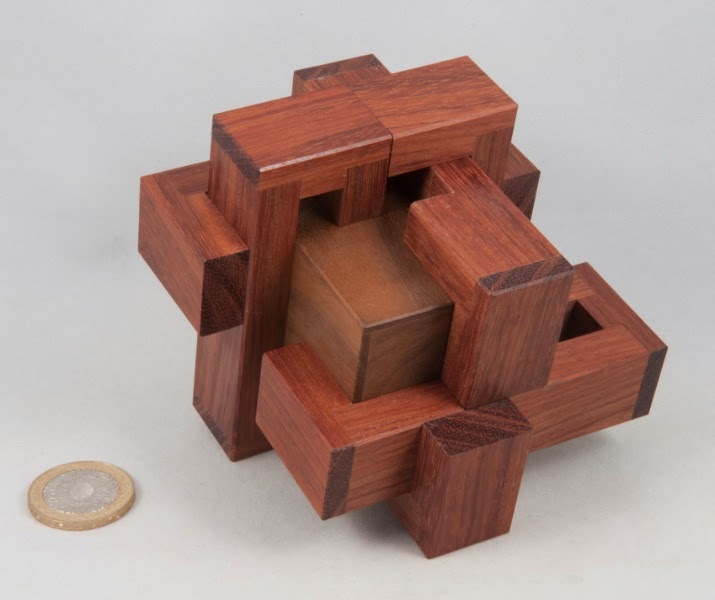 I’m generally impressed by the craftsmanship and the engineering involved in these Japanese puzzle boxes, but this one is really clever the way it plays on the interaction between the two (almost) separate, yet very interconnected cubes. 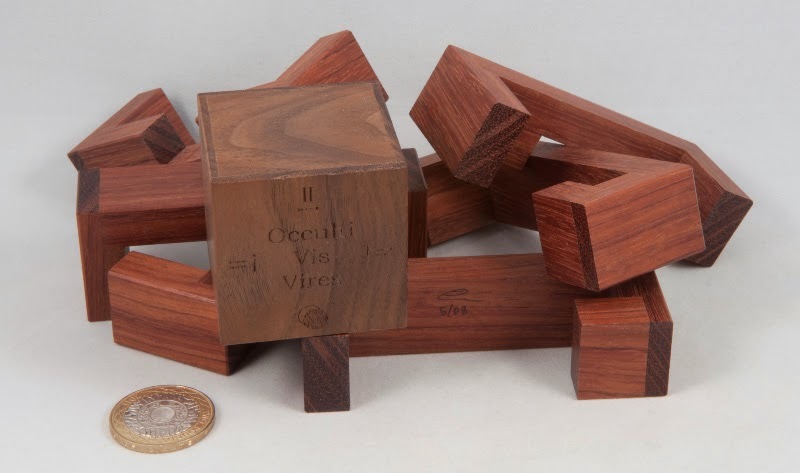 Another Binary Drawer is a slightly lager box from the fertile mind of Hiroshi Iwahara – he of Super-Cubi and King-Cubi-fame. One of my mates had bought a copy previously and I’d asked him what he thought of it. He described it as less of puzzle and more of a demonstration of the principles of the binary system. Satomi had a copy of on her table so I hauled it out and had a play with it and I think Ali’s description was spot on! I bought a copy on the spot. Usually when we talk about binary systems in puzzles we’re talking about Gray Codes … this time we aren’t – it’s pure, unadulterated binary counting. The front of the box has a set of eight little drawers that open when the appropriate number is entered using the three sliders across the top of the box. The drawers represent the numbers zero through seven and moving each of the sliders they effectively register a zero or one on that binary place. I was totally hooked on it when I tilted the drawers down and the first drawer slid out, and then each successive drawer popped out as I counted up to seven. As Ali said this isn’t really a puzzle, it’s a real world implementation of counting in binary – but then even if you don’t know your binary, it’s a pretty simple task to get all eight drawers open. 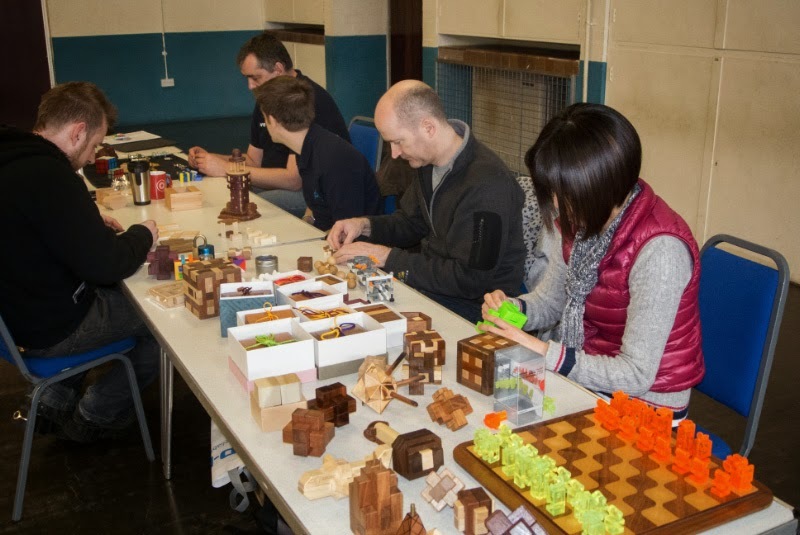 Seems like absolute ages ago that we had our first Midlands Puzzle Party – mostly in our dining room. A few meetings later we filled the dining room and most of the lounge and then we outgrew chez Walker altogether – so now we only end up back here for the occasional post-MPP-BBQ. Growth is definitely good though – we’ve all made a bunch of new puzzling mates and found some great new toys together… right then, back to the here and now. I’d remembered to take my copy of Mike Toulouzas’ Illusion along for Jamie this time after I’d left my rucksack at home for MPP13. (I’d remembered to take the crate of puzzles, just not the rucksack with two extra puzzles in it – I’m not that daft!). 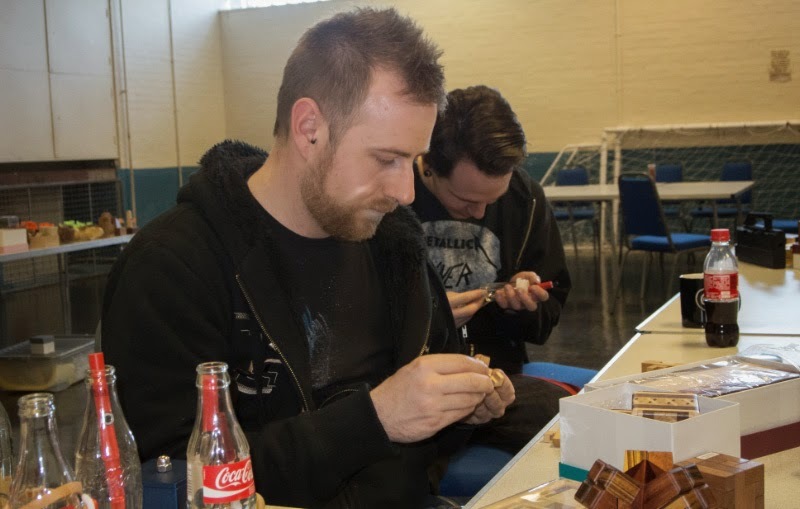 Jamie had a bash at it and it didn’t take long for him to find the appropriate axis to start getting things to come apart… and it only took a little encouragement to get him to take it to bits. Judging from the look on his face afterwards, I think he likes it – so I’m glad I remembered to take it along this time. 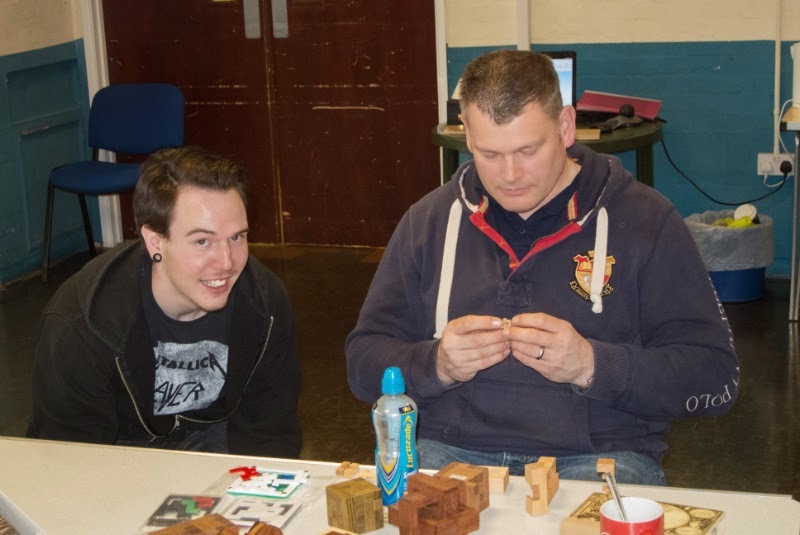 Steve had brought a number of seriously awesome puzzles along, including one of the most unusual-looking Stickman puzzleboxes in creation – the Lighthouse. I’d never seen one of these in the flesh before, so I made sure I could spend some quality time with it! The details on this beauty need to be seen to be appreciated. The Lighthouse stands on a rocky base with little rocky outcrops sticking out all over the place – all perfectly carved in wood. The lighthouse itself appears to have some sort of thread cut on the corners and the top section looks like it might form part of a screw mechanism – only problem is the whole thing is totally locked up… It took me quite a while to find how to start this puzzle as it turned out I was looking in totally the wrong place for the first move… the next few followed eventually and then I had something I could work with … finding my way into one of the two compartments before I began to lock it all up again. An absolute delight to play with and definitely on my wish list – hopefully one day I’ll have one of my own and then I’ll allow myself to go after the second compartment as well … a lovely experience – Thanks Steve! I’d also taken a copy of a three level nested burr by Hiroshi Kaneko along and suggested a couple of the regulars have a bash at the burr… the look on their faces when they made some space between the pieces and spotted another burr inside the first one was pretty good, but the deep respect when they got that one open to find the third one nestling inside was something else altogether … yet from the outside, it looks pretty ordinary… sometimes looks can be rather deceiving. Ali had his collection of Rocky bolts neatly laid out on some fabric, and at one point Steve chanced upon one of Wil’s entanglement spanners (you know the one: spanner with a loop of chain around it trapping a ring) and set about what will probably become known as Steve’s alternate solution to Rocky’s bolts. Luckily I had my camera handy to capture this most elegant of solutions. 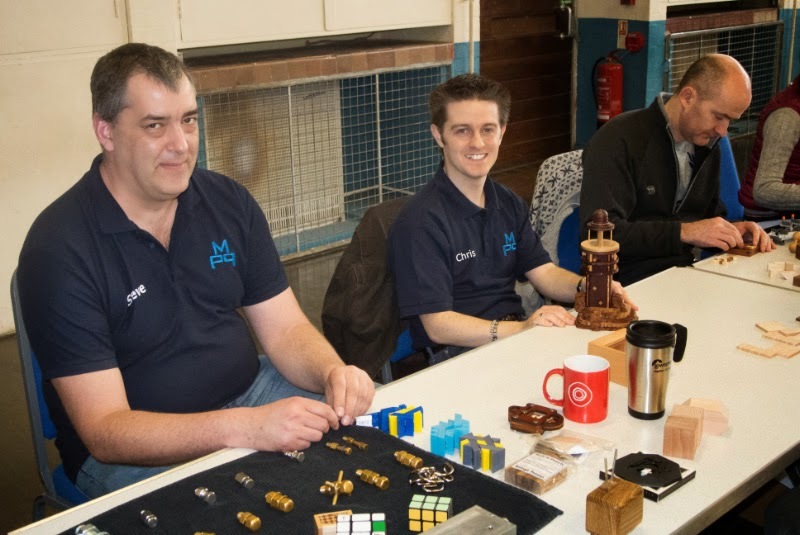 Simon Bexfield had a huge collection of puzzles and toys as usual and took great delight in demonstrating his Bex Box of Invisibility – a cubic box with holes all over the place that you could see through and shine laser pointers through (yes, we played! ), and yet when you put something through the centre of it, you could still see right through it… Simon’s patter was top notch as usual: this was his box for keeping his Black Holes in… it all makes sense, I’m sure … Thanks Simon for my DIY Bex Box of Invisibility! What we may have lacked in numbers, we definitely made up for in banter and puzzling. Yet another excellent MPP – nice one Nigel! Yavuz Demirhan’s Konstrukt is a burr for non-burristas (like me!). It’s a combination of a simple three board burr in the centre with an interlocking cage surrounding it. The cage is made up of twelve identical pieces (albeit in three colours to make it look pretty - really pretty!) that rely on the internal board burr to actually stay together. 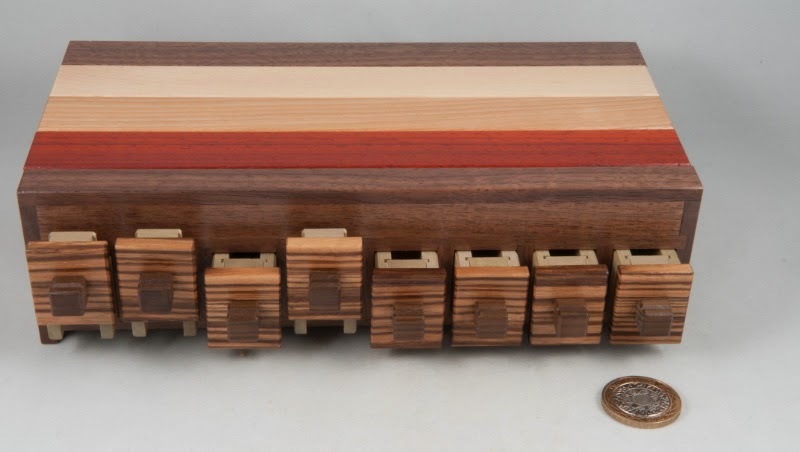 My copy came direct from Jakub at the New Pelikan Workshop after I spotted a pic of it online and then saw a copy in the flesh – it looks brilliant – especially given the colours of the woods that Jakub and the guys have used. 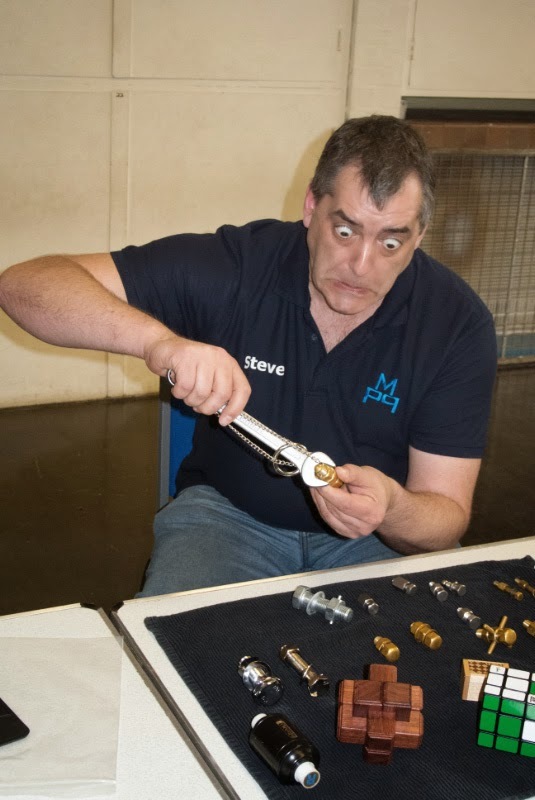 As a take-apart puzzle it’s pretty straight-forward – there’s only one or two things you can move initially … make some space and you can take the first piece out, then the rest follow in pretty quick succession – leaving you with the internal board burr that comes apart in the usual manner. Reassembly is only really slightly trickier. You start with the board burr and then work out how the cage pieces need to lie against the boards in order to achieve the target shape and not interfere with one another (now there’s a thought for you to conjure with!). A fun assembly for neophytes that ends up looking reasonably impressive.